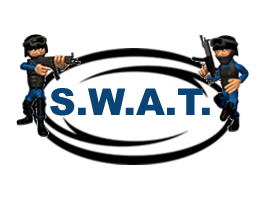 We all know what S.W.A.T. teams do. One of your team members has been taken hostage by a group of gunmen. As a team you have to enter the building, try and eliminate the gunmen and rescue the hostage. Each team member is issued with a certain amount of rounds and the team is given a time limit. Teams compete against each other. One team is the gunmen and the other team is S.W.A.T. When the time is up the two teams change roles. Please note that with this activity BB revolvers are used. Face protection is issued to each team member. Rules explained by coordinator. This is an excellent Conflict Management activity.